“Almost too good to be true” (Refinery29), “The online incubator for dream products” (W), and “Beauty editors squeal with happiness” (InStyle) are some of the ways this beauty company launched in September 2015 has been described. 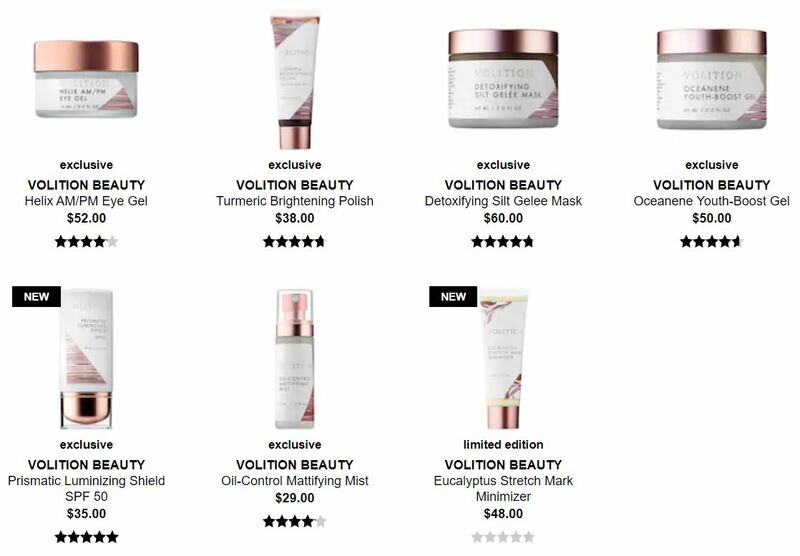 Volition has changed the beauty product development process by giving people the opportunity to submit their ideas, connecting them to labs to create products addressing their needs, and offering a platform where community members vote to determine which products should go to market, thus creating products that address real needs and that people want. Anyone can submit their idea through an online portal by answering “What beauty problem can we help you solve? Or tell us about your product idea”. Once submitted, Volition staff review the idea for feasibility, brand fit, and market potential. 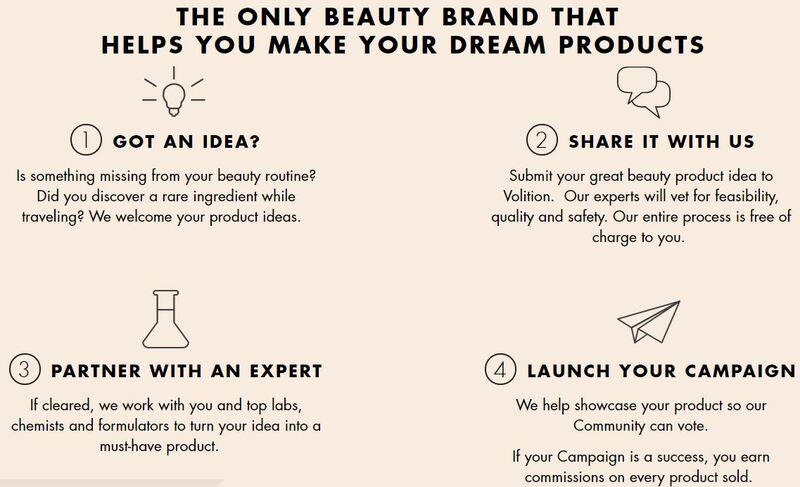 If the idea is chosen for development, Volition works with the innovator (the person submitting the idea) and developers (chemists, R&D teams, and labs with experience in the luxury cosmetics industry) to develop a product profile. 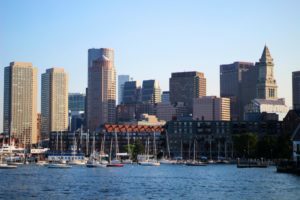 The product is shared on Volition’s online Campaign platform, where community members can weigh in through votes or product surveys to further refine the product. If the Campaign gets enough support, the product is launched. Volition creates value by harnessing the power of consumers and leveraging it to make better, more original products that address people’s unmet needs. For instance, one of its products, called Mission Brows, are realistic, stick-on brows developed by a cancer survivor. Creating products based on innovators’ perceived needs leads to more unique products, while crowdsourcing the go/no go decision-making process helps ensure that there will be demand for the product. Furthermore, crowdsourcing can much more cost-efficient than garnering consumer insights through traditional quantitative and qualitative assessments, thus leading to the creation of products in a more efficient manner. Volition also creates value by empowering people (usually women) who have ideas but lack the expertise to launch their own products. Furthermore, the company has a revenue-sharing model, and thus also financially rewards innovators. If innovators choose to defer their revenue share to charitable organizations, then Volition increases the innovator’s revenue share and matches the amount, thereby also benefiting society at large. Volition captures value by selling their products through their online platform. In 2017, Volition formed a partnership with Sephora, thus enabling the company to market and sell its products through Sephora.com and its retail stores. The main challenge I see with Volition is keeping its community active. Volition have put measures in place to encourage innovators to continue to pitch their ideas through the Volition platform: its revenue-sharing model (though the lack of transparency in the exact compensation structure could discourage innovators from sharing their best ideas) and its time to market (beauty brands typically take 3-6 months to get a product to market, while Volition has cut this time to 3 to 6 weeks). However, retaining its community of voters will be much more difficult. Currently, community members must vote through Volitionbeauty.com, thus requiring them to actively check the site for new products. A larger social media presence (e.g., Instagram) could help the company stay in touch with its community members and inform them of new products. Strengthening its brand name is also critical. Especially as competition increases from similar startups and from established companies moving into the crowdsourcing space, community users must find reasons to engage with Volition over other brands. Its partnership with Sephora will, without a doubt, give the brand more legitimacy and expose more potential users to the brand. However, Volition’s ultimate success hinges on its ability to continue to offer its community a compelling value proposition. Interesting read. I agree that voter engagement is an issue, but I would also be concerned about the profitability of this company. I wonder how they can efficiently make products with such little lead time, while also giving away a piece of the revenues to the idea creator? Interesting, I’ve never heard of Volition! I’ll have to check it out. One risk that I find with companies that use Crowdsourcing for product innovation is that it may lead to a short-term boost in sales (due to novelty effect) but may not be indicative of long-term customer interest. For example, this happened with the Lay’s “Do Us a Flavor” campaign and the Company had to discontinue products with consistently low sales. Really interesting post! I did not realize more beauty brands were employing similar strategies to Glossier’s, and I love the story of the Mission Brows. I wonder if Volition could boost engagement and brand recognition by partnering with celebrities or other women who represent the brand’s values and leaning on them to spread the word. I do share your concern about beauty brands being able to maintain high levels of community activity in today’s e-commerce world, given millennial consumers shopping online are often less sticky than with traditional retail models – especially when there is always something new and exciting to try! Thank you for the post! Feels fresh and relevant in our age of customization indeed! What I think could be a struggle is making the ever-growing number of products profitable. Assuming a healthy growth of the Volition community, there will be more and more ideas coming, which will mean that Volition will either have to a) extend their product line substantially, which might men heavy R&D expenses for products with very niche clientele; b) regularly drop old products, which might frustrated current loyal users; c) or restrict new products launch, which will mean that fewer new ideas will find its way to the shelf, thus making the community less excited and, most-probably, less engaged. No expert on beauty products, but I think this is a really interesting venture. Agree with the author that Volition may want to think about strengthening its presence on social media platforms to drive better user engagement. Volition is barely present on Twitter (~1000 followers), but if they are really interested in increasing feedback quantity, it could be worth the effort to acquire more followers on Twitter and begin posting polls on their for new products under consideration. I also poked around on the website a bit — honestly, it seems very quiet, and unless you want to submit a product idea, all you can really do is vote for your favorites on a bulletin board or click around a shopping page. No “creator community” to speak of, and there’s no way to communicate on a P2P basis through the site. I suspect they will need to build out more features if they want to kindle any sort of continued growth. Thanks for this informative post. I too have reservations regarding its ability to retain its voter community. Given how crowded the beauty space is already, I have a hard time seeing how this concept can meaningfully engage voters in the long-term, unless they somehow are also privy to financial incentives from successful launches. Interesting post, thank you! I wonder if Volition will face the same problems as Quirky. While the manufacturing process may be less intensive, I think there is still significant knowledge and investment needed in the process. Additionally, the crowdsourcing of ideas brings a lot of variability into the manufacturing process.